In the lecture ‘Archeologia dell’Opera d’art’, Giorgio Agamben proposes the idea that crisis in Europe is essentially a crisis of relationship with its own past. Referring to Art as ‘a figure of the Past’, one wonders what role has Art in the Present, warning that conflict between Art and ‘Opera d’Art’ reveals that Art is made, not from the completion of the ‘Opera d’Art’, but from Life. Convoking this position allows us to question the visibility, but also the invisibility of the past of this place, through the testimony of its buildings and surfaces, but also the invisible matter that underlies beneath our feet, matter of Time that consistes of forgotten toponyms, pier walls or pavements. Reusing the matter of the Past is a chance to (re)build our relationship with the Present, allowing us to develop a sense of space in which Time, that Archeology brings back to us, in an informed way. 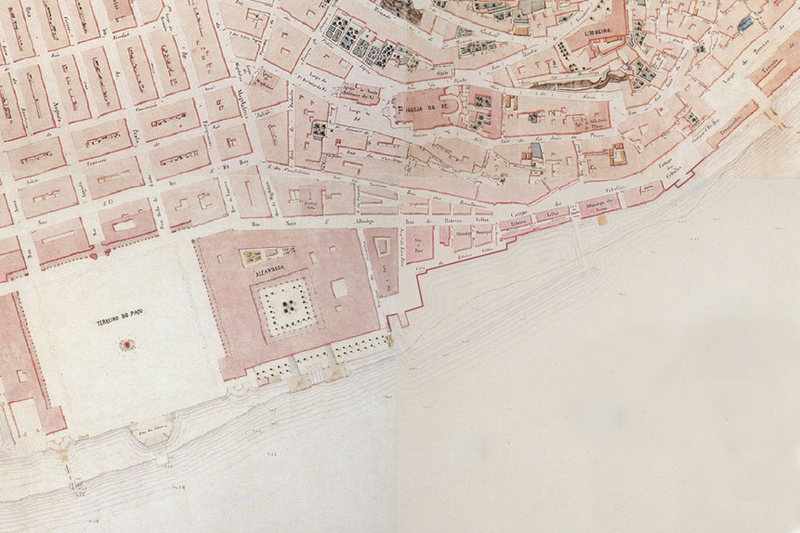 How big was the Praça da Ribeira? And Campo das Cebolas or Terreiro do trigo? Our perception and experience of place that Gil Vicente suggests, and Saramago eludes, is ultimately reconfiguring the space in which Life becomes this Work. The successive representations of Lisbon´s Ribeira focuses on the gradual appropriation of the Tagus Margin through embankments, construction of walls, piers, ramps and stairs, turning the natural presence of the beach in urban platform. 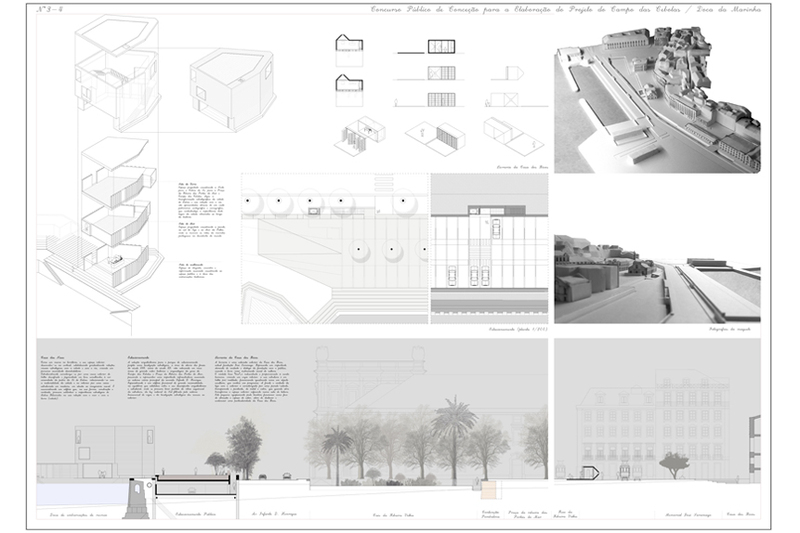 The transfiguration of this riverfront Landscape is made of the added walls, ‘portas do mar’, temporary markets, docks and customs, but also of ‘autos-de-fé’, processions and city events; demonstrations that replicates, in time, the expression of Citizenship, Absolutist Power and Democracy. This dynamic interpretation of the city space transformations is described in a linear space and marginal, which materializes gradually advances to the shoreline up to the limits known today. 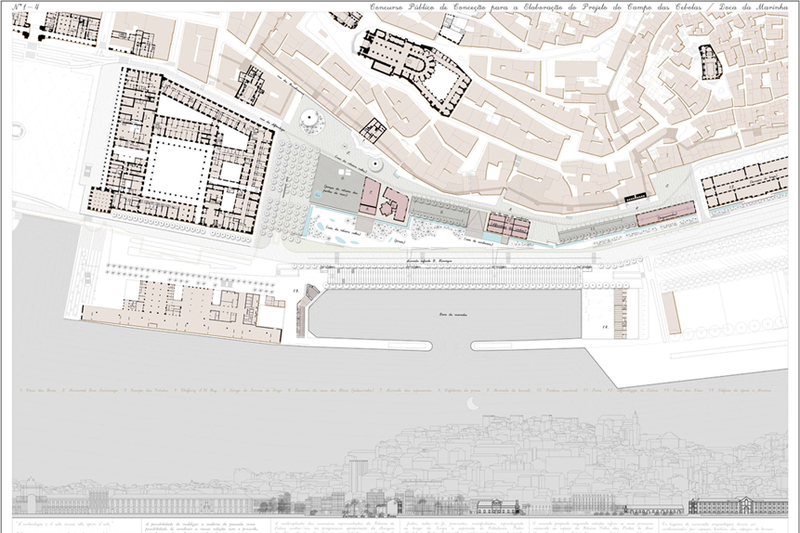 The proposal interprets critically the competition objectives in relation to the existing and foreseeable conditions, pointing to the realization of one of the most extensive and fascinating works of Archaeology, which will reveal a significant part of the eighteenth-century Wall Harbour that ruled over centuries the configuration of this space, placing it in a contemporary context and presence. In this sense it is proposed a transformation made from an unitary and longitudinal space reading, instead of a fragmented sequence of urban spaces, that exists today. This new space operates like a grounding of the compact city, made of natural space (the memory of the ‘beach’ spaciality) to, progressively, enhances the complexity and sophistication of the current Lisbon´s Harbour. This hypothesis questions the Silo Car refered in the competition program, and proposes an underground parking location near the wall of the dock, allowing the conservation of the wall sections that probably still present in this space, and its revelation. 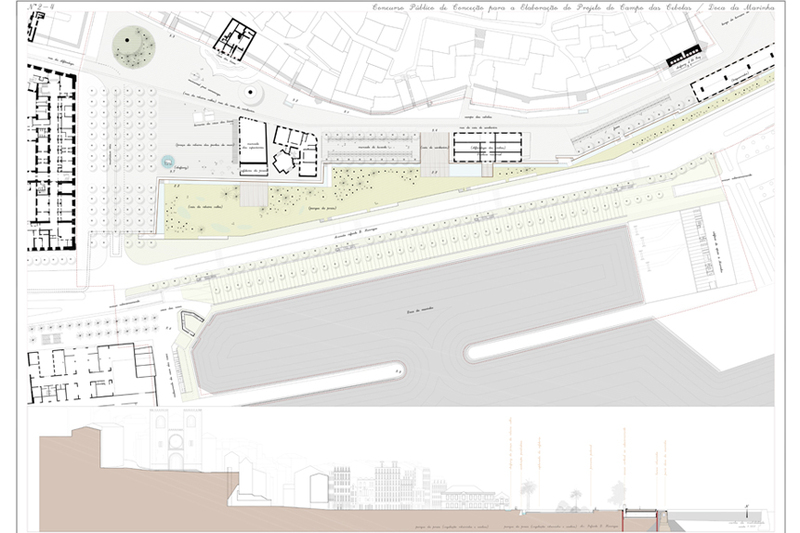 The wall, to be reveal, emerges as the new structural configuration of the space allowing the definition of three different platforms: Campo das Cebolas/Praça da Ribeira, the Ribeira ‘Beach’ Park, and Marinha Dock / Infante D. Henrique Avenue – differing topographically, typologically and even ideologically, as a result of its historical origin process.